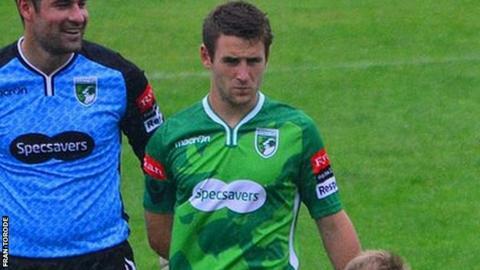 Guernsey FC captain Sam Cochrane says the Green Lions will always struggle to match better-financed teams. Guernsey on Tuesday and have been beaten in their last five league games. "That side have brought in some players from around the Conference and Ryman Premier level because financially they can do that," he told BBC Guernsey. "We're limited to our squad, the quality is what it is and we continue to strive to improve." None of Guernsey FC's players are paid and are all based on the island, with the club spending almost all its budget on travel costs to both leave Guernsey and bring other teams to the island to fulfil their Isthmian League Division One South fixtures. "In the UK financially these clubs have budgets and it's a ruthless business," Cochrane added. "They'll bring players in, they'll turf players out, managers will come and go and the bigger budget a club has got, players will come down from leagues above and turn up and play for them. "Suddenly you have a side that's incredibly strong at our level of football, that's where we are, we just deal with it and we keep going." The Green Lions, whose last league win have slipped to 19th in the table, having finished last season in fourth place. Guernsey will have former professional goalkeeper Chris Tardif back in their side while Ryan-Zico Black and Dave Rihoy could get recalls. "We've got home advantage, although our form's not fantastic at home, let's be honest," the Guernsey skipper said. "We lost to Chipstead in the opening game of the season, which was disappointing, but we're desperate to pick up some points. "We want people to keep supporting us as we are and understand where we are at this level of football and what it's about."